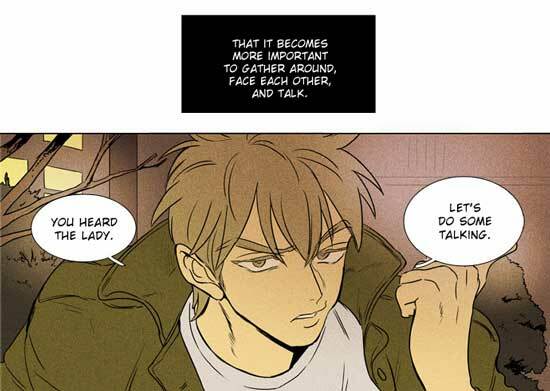 Last chapter, Soonkki was pondering how she would reinvent another genre and switch away from Slice-of-Life webtoons. A chapter each day is a dream coming true~!! Thanks a lot!!! They gotta let it all out! They better let all of their hatred out through those punches. I really hope that they can solve their misunderstandings. I'll go with Jung on this and believe that Jung really wouldn't have been the one to break In Ho's hand or have it broken. These releases have been making my week <3 Thanks for the chapter! First a healthy meal, then a healthy beating up! I don't personally detect any problem right now, but there was some people who had problems at some moment today. Perhaps the server was busy or something.